If you’ve stopped by for a light read, stop here. 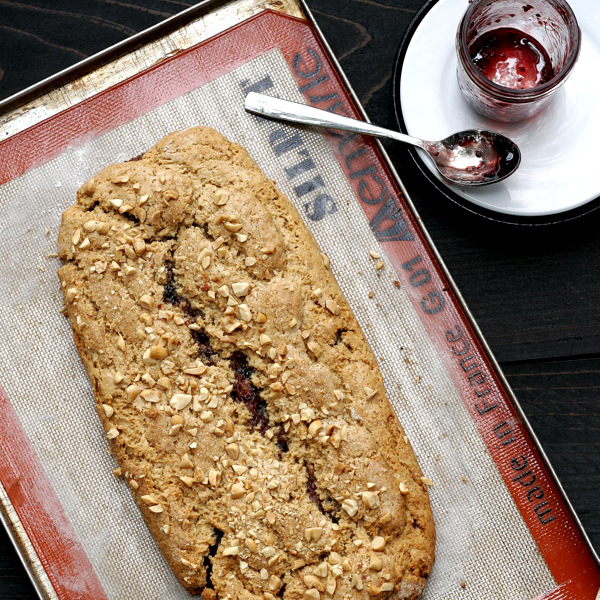 But before you go, do consider scrolling down for my peanut butter and jam scone recipe. They’re guaranteed to put a smile on the face of anyone who’s ever wished they could eat a peanut butter and jelly sandwich for breakfast. This is my third attempt at storytelling here this week. Each time I put pen to paper, fingers to keyboard, my words ring hollow. Instead of spinning tales for you about the three giant raccoons that are calling our yard “home” or my current obsession with Indian cooking videos on YouTube, all I can think about is my friend Chris. It’s ironic really, because before Sunday morning, it had been weeks since Chris had entered my thoughts. Chris, or “Raible” as I always called him, and I were college friends. We were close, not in a boyfriend girlfriend kind of way, more like brother and sister. I did my best to help Raible understand what went on in the minds of college women, and he made sure I never took myself too seriously. Raible made me laugh, always, at the world, at myself. He was crass, irreverent, and politically incorrect in all the best possible ways. He was wicked smart, pragmatic to the point of being annoying, and stubborn. He was loyal. He was generous. And underneath all his bravado beat a very big heart. After college Raible became a U.S. Marine while I went on to grad school. We stayed in touch, though over the years the time between our calls and visits got longer and longer. Still, ours was a friendship that endured. I’ve witnessed countless friendships gently fade to black over time like a candle that self-extinguishes when it runs out of wax. But with Chris, no matter how much time had passed, we managed to pick up right where we left off–somewhere between a tasteless joke about what I was wearing and why Franco Harris was the greatest Pittsburgh Steeler of all time. Lieutenant Colonel Christopher “Otis” Raible, 40, leader of Marine Attack Squadron 211 was killed in Afghanistan by Taliban forces on Saturday morning. My heart aches knowing that Raible is no longer a part of this crazy world. So all week I’ve been doing what I do best when my heart hurts: I bake and cook non-stop, I put too many miles on my running shoes, and I let myself linger in Greg’s arms when he hugs me goodbye each morning. The idea for these scones has been rattling around in my head ever since I tried Heidi Swanson’s Raspberry Mega Scones. Baking them slab-style and filling them with jam make these scones moister than their kin. Try them with your favorite jam or jelly, or skip the jam and fill them with dark chocolate morsels instead. Combine flour, sugar, baking powder, baking soda, and salt in a mixing bowl. Using a pastry cutter or two knives, cut in the butter until the mixture looks sandy. Mix the peanut butter in with your hands until large clumps form. Add the milk and yogurt. You want a soft but not sticky dough. Add more milk a tablespoon at a time if the mixture is too dry. Turn the dough onto a lightly floured Silpat or sheet of parchment paper and pat it into an 11×9-inch rectangle, about 1/2-inch thick. Spread the jam over the dough. Fold one long side of the dough toward the center, then fold the opposite side over that to form 3 layers, as if you’re folding a business letter. Press lightly on the top of the dough to seal it. To discourage the dough from breaking as you lift it, fold the Silpat in and then peel it back to separate it from the dough. (Thanks for the tip Heidi!) Slide onto a baking sheet. Brush the top with milk or cream and generously sprinkle with sugar and peanuts. Bake for 30-35 minutes, until the scone is firm to touch and dark golden on the bottom. Allow to cool for 10 minutes on the baking sheet, then transfer to a wire rack. Slice into squares to serve. Makes 1 slab scone or about 10 individual scones. Not a peanut butter fan? Try these Cherry Cream Scones instead. My heart hurts for you. Thanks for making me tear up at work. I am so sorry for your loss…friends that stick are too hard to come by. Know that by writing about him you honor him. Sorry about your buddy. I had the same experience during the Vietnam War, and it was horrible to lose my friend to such a senseless cause. And about the scones…how do you think it would work to put peanut butter inside the scone? I’m so so sorry for your loss. Your writing does him a great honor, and gives you the last word in a loving and eloquent way. I wonder if you could forward to his family? I’m so sorry. I hope it helps a little to that we are all thinking of you and him. Chris sounds like a very special man. You were both very lucky to have had each other as friends. Your tribute to him was just lovely. 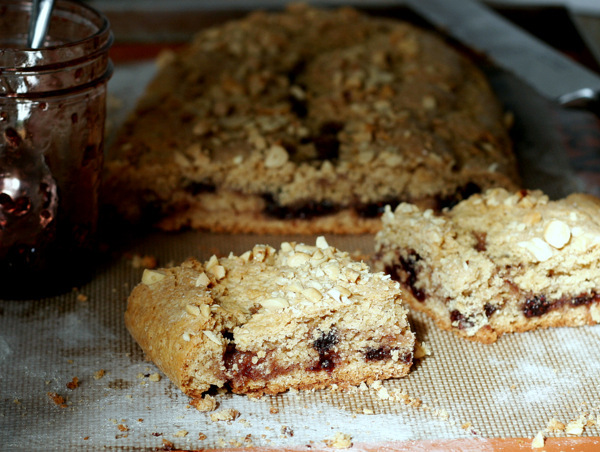 Oh, and cool way to do scones in a slab. I have never seen that before! Thank you all so much for the kind words. I feel truly blessed to be “surrounded” by friends and family, both near and far.